CuteZCute Cutter Review and Giveaway! 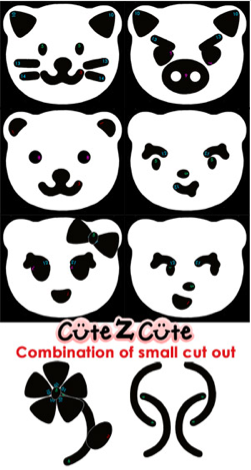 I am excited to share the new CuteZCute cutter with my readers! One lucky reader will win a CuteZCute kit of their own. This contest is open to readers worldwide. This tool takes the guesswork and time out of detailed cute lunches. I was given a kit to try out and review. I have received no other compensation for this review. The CuteZCute Food Deco Cutter kit comes with 6 pieces. There is a face frame for the template, 4 animal feature cutters including a panda, frog, pig and cat and a great pick for poking out small pieces from the templates. My favorite feature aside from the awesome possibilities and ease of use is that each facial cutter has a side for cutting through on one side and for simply imprinting on the other which takes the guess work out of hoping you don’t ruin a bunch of bread. Many cutters also come with intricate designs but don’t offer a way of getting the pieces out without ruining what you’ve cut. This Panda Assistant poker makes it very simple to get out the eye, ear, nose and mouth pieces without poking small holes in what you’ve cut. 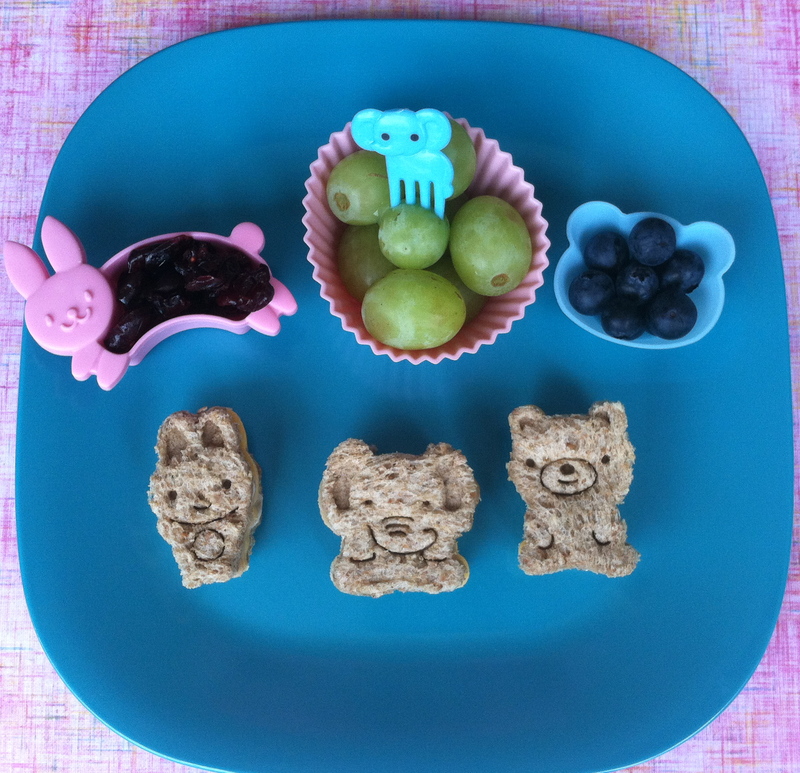 This panda lunch was the first lunch I made with the CuteZCute cutter for a lunch. 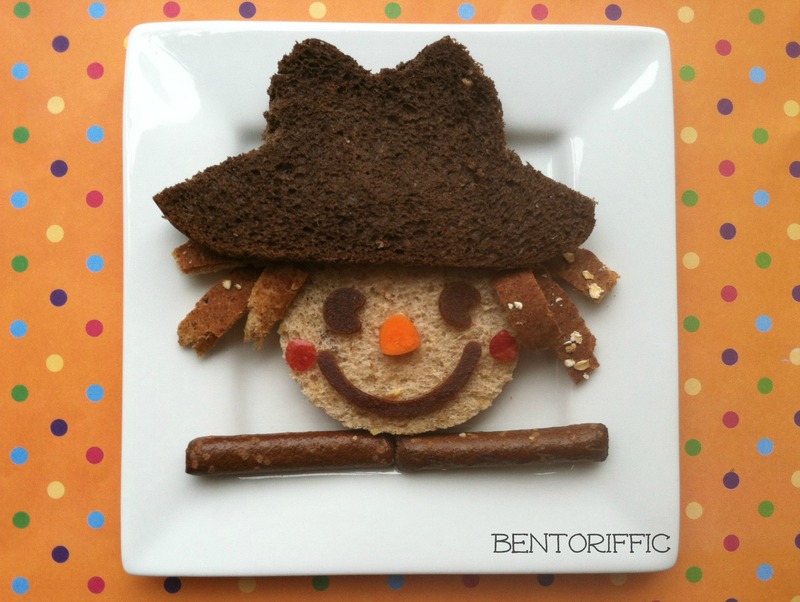 I used whole wheat bread and cut the face features from Stretch Island fruit leather strips. For each creation, you simply cut the face shape from whatever you’re using. I’ve seen pizzas, rice, cookies, english muffins, bread, tortillas cheese and you could even use pie dough for individual pies. I also did this almond butter and jam pig lunch with the cutter. I can tell you after a couple of years hand cutting shapes, this kit is a dream. 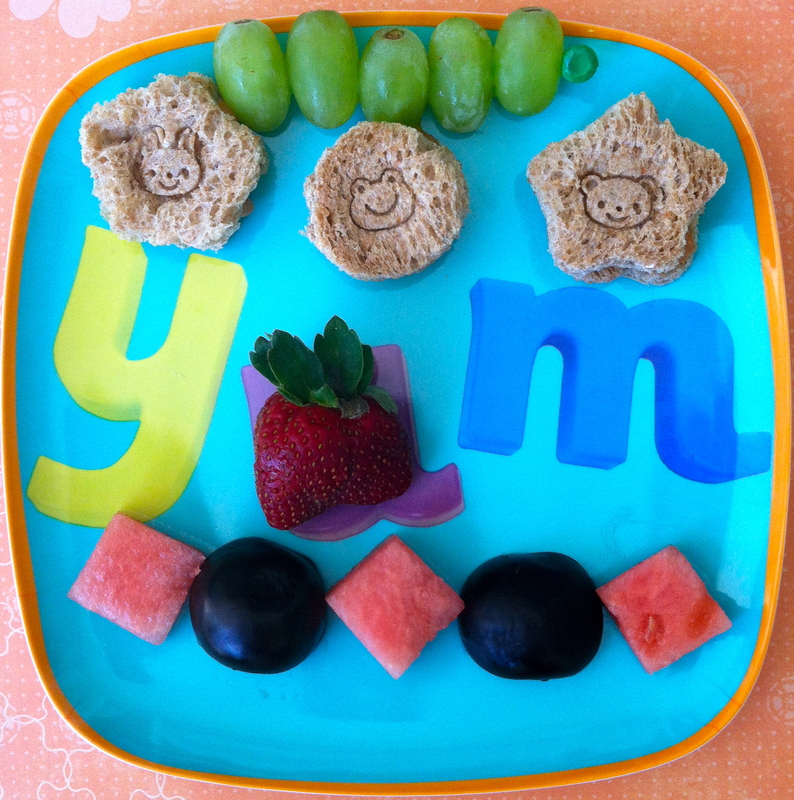 I spend about 10 minutes tops making the lunches with the CuteZCute. 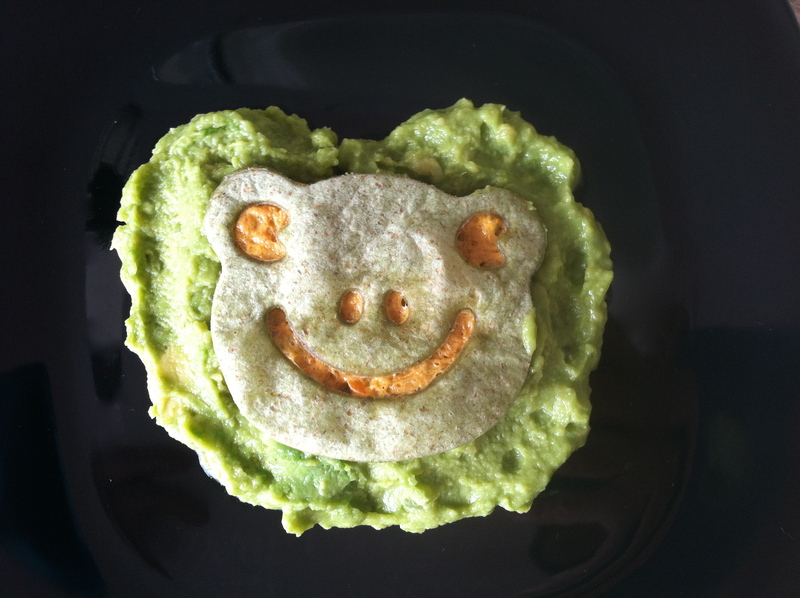 The above frog quesadilla was made with green tortillas and Daiya brand non-dairy cheese shreds. The frog is on a Wholly Guacamole lily pad. From start to finish this took me less than 10 minutes. Some examples of the different faces you can make with the cutter are below. I decided to come up with a few holiday ideas for the CuteZCute on my own just to show how quick and easy it can be to have fun. Now that Halloween’s over, there are still fall festivals happening so I thought a scarecrows would be fun. I used the face template for the face. I hand cut the hat and used the bread crust scraps to make hair. The facial features are the frog eye cutter made from fruit leather. I used the pig ear cutter on a mini carrot slice for the scarecrow’s nose, the pig’s eyes are the cheeks made from apple skin, and the frog’s mouth cutter is the scarecrow’s mouth from fruit leather. I used 2 pretzel rods for the scarecrow’s arms. 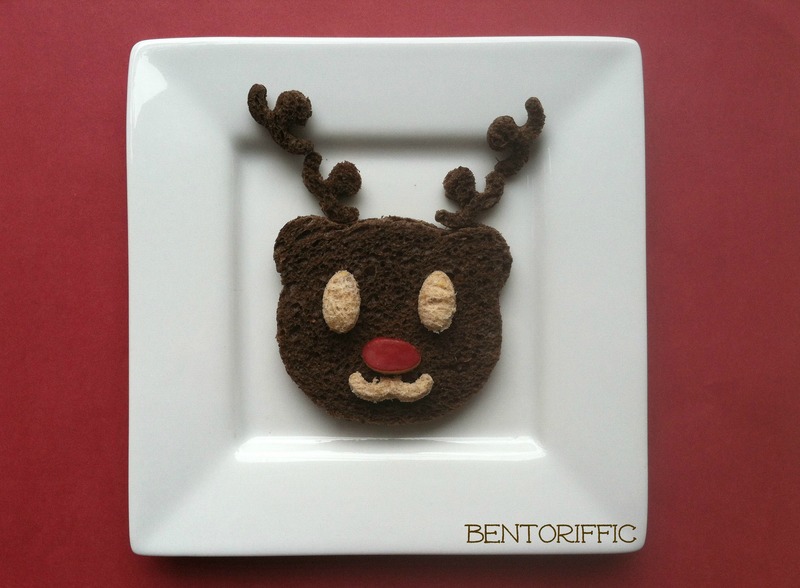 I made a reindeer out of pumpernickel bread and the face template. The eyes and nose were the panda bear’s eye cutters. The reindeer eyes are the bread scraps from the scarecrow as is the reindeer’s mouth made from the panda mouth cutter. The red nose is also using the panda bear’s eye cutter used to cut a small piece of apple. I used the bread scraps and the panda mouth cutter to make the antlers for the reindeer. 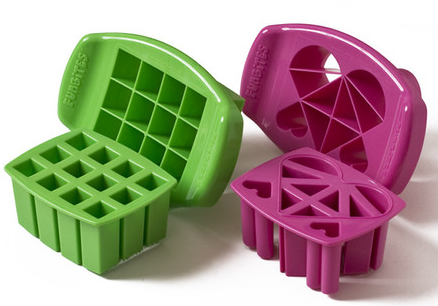 *It’s owned and operated in the U.S.A.
*It’s made from durable, food safe plastic and packaged in recyclable packaging. *It’s so simple your kids can use it. *It’s a perfect birthday gift, holiday gift and stocking stuffer. *At $8.99 it’s affordable to almost everyone considering how many options the kit gives and available for sale at both my favorite bento supply site All Things For Sale and on Amazon. Contest opens 11/2/2012 and ends at 12:01am on 11/9/2012. Winner will receive one CuteZCute Food Deco Cutter Kit. Contest is open to all people worldwide. 2.Pin a photo from this giveaway to Pinterest, and leave a comment with the URL to the Pin in my blog comments. 3.Tweet about the giveaway and leave your twitter username in my blog comments. Winner will be chosen by random.org and posted on 11/10/2012. Winner will have 72 hours to respond to request by email. If first winner doesn’t respond in the given time, a new winner will be chosen. Please make sure you leave me a way to get a hold of you. Good luck! 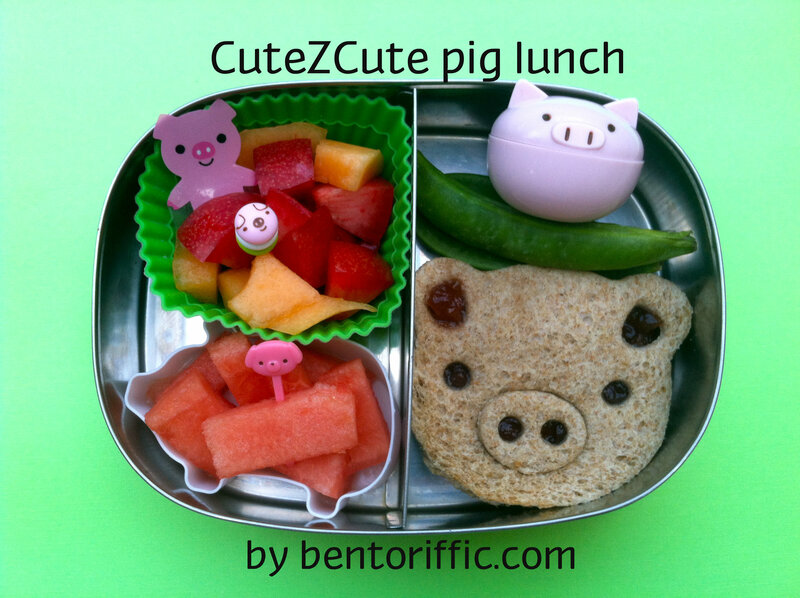 I am fortunate enough to have been on the list of people who were chosen to try out the new CuteZCute cutter for fun sandwich and bento faces. I have to say I’m super impressed at the easy of use and cleaning and the adorable, fun lunches in about 5 minutes flat. I can’t wait to let my 4 year old make her own lunches with it. For the affordable price it also will make for super cute gifts for the holidays too! All these tools come in 1 box. The cutter is available at my favorite bento supply store Bento USA by All Things For Sale as well as on Amazon. The panda face is on Rudi’s whole grain bread with a Stretch Island fruit leather face. The sandwich is on a bed of brown and wild rice with grape tomatoes and sugar snap peas. At the top left are grapes in a flower shape with a piece of panda baran (food separator) for decoration. at top right is a clementine orange I colored a panda face with a marker & peeled the ears up for fun. The lunch is packed in her Easy Lunchboxes container. 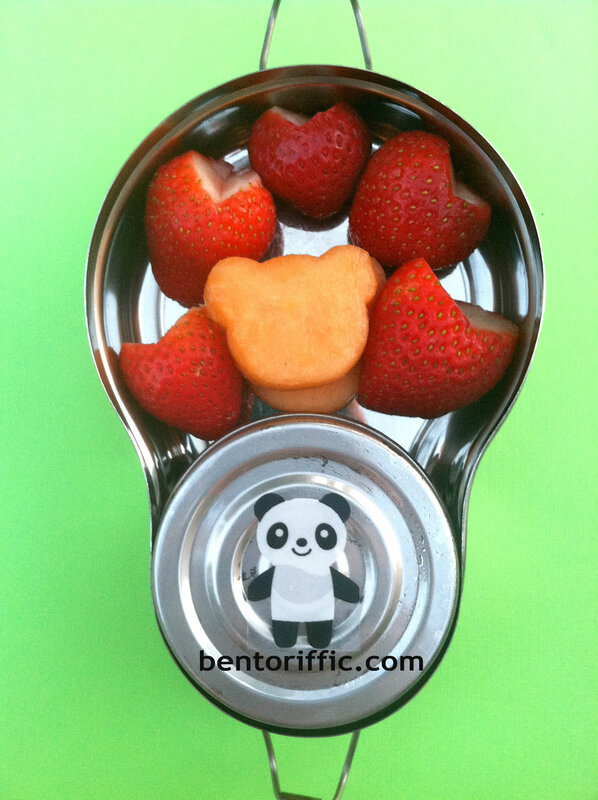 Miss G’s snack today was strawberry hearts, panda face shaped cantaloupe pieces and apricot mango soy yogurt in the round container in her Happy Tiffin bento. Even Miss A gets a small version with the pig cutter. On the left side of her LunchBots Duo are pieces of cantaloupe, pluots, and below in the white pig silicone cup are watermelon pieces. Above the sandwich on the right is a small pig container with dried cranberries in it and sugar snap peas. The sandwich is simply whole grain bread with almond butter on the bottom and strawberry jam on the top so that it squishes through for color. We’re back from a fun, long weekend away. I hope everyone had a relaxing weekend and a safe 4th! I can’t say I planned well for lunches today since I was feeling especially sleepy this morning. The girls are off to a week of summer camp at their regular school, and the adults are back to the grind. I got a new bear face sandwich cutter. To be honest it was not what I expected. Maybe that is because I haven’t learned how to use it properly yet (instructions in Japanese), and maybe I should have planned ahead. In any case, Miss G gets to be the guinea pig on this one. Whole grain bread, although it is the best FOR you does NOT make the best shapes and mold well in presses. What I got was a bear with a bit of a skull fracture. Oops! It’s definitely not the prettiest lunch I’ve ever made, but I believe it’s important to show you that nothing’s ever perfect. My daughter will still think it’s fun and like it even if his face is falling apart. To salvage his face I stuck raisins in his eyes, almonds in his ears, a prune (which she really does love and eat) and dried goji berries in for the mouth. The goji berries are a newer food to my girls. I don’t expect them to eat it all, but they must TRY them. The bread is Rudi’s brand Nut & Oat bread filled with almond butter & strawberry jam. Above the bear at the top left are mini carrots & dip in the bear container. 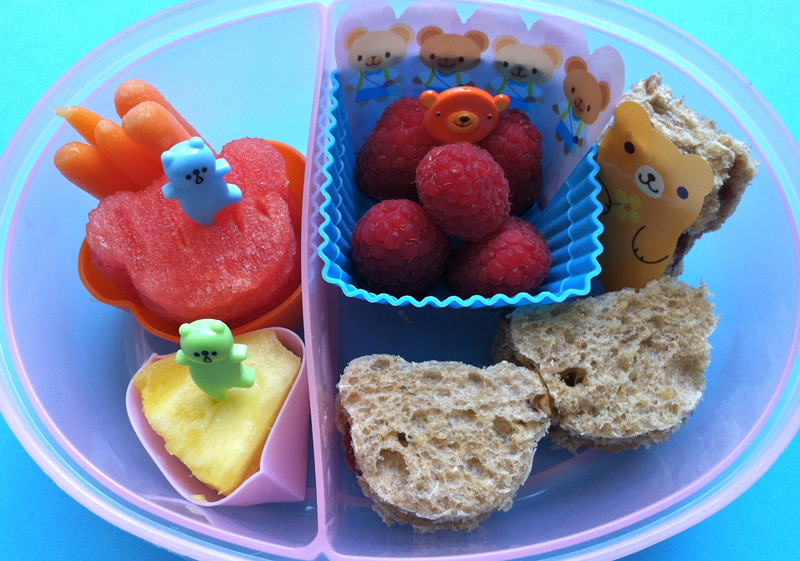 At the top right are bear shaped watermelon pieces packed in her Easy Lunch Boxes container. 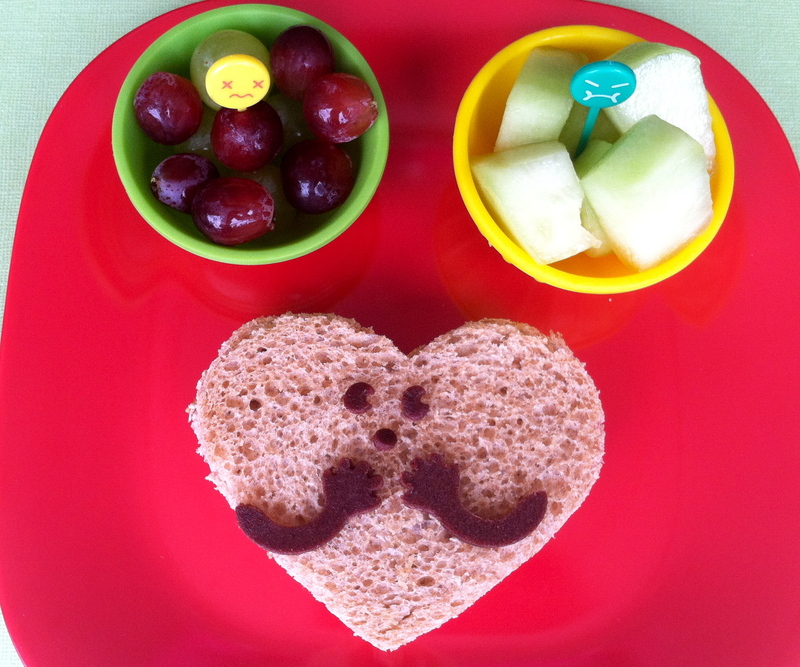 Miss A gets a simplified version with little bear sandwiches today. She doesn’t do well with the bigger sandwiches so I made her 3 little bears. Hers are also almond butter and jam on whole grain bread. 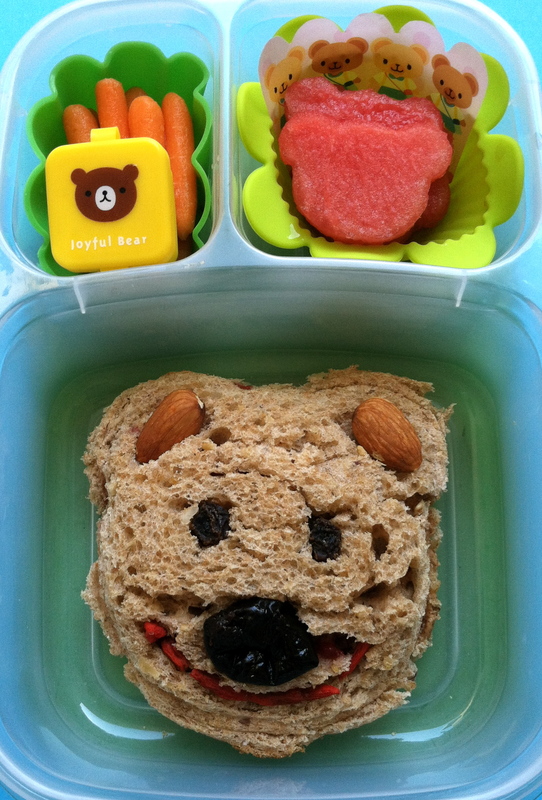 With the sandwiches are organic raspberries, a bear pick and bear baran (food separators) just for fun decoration. 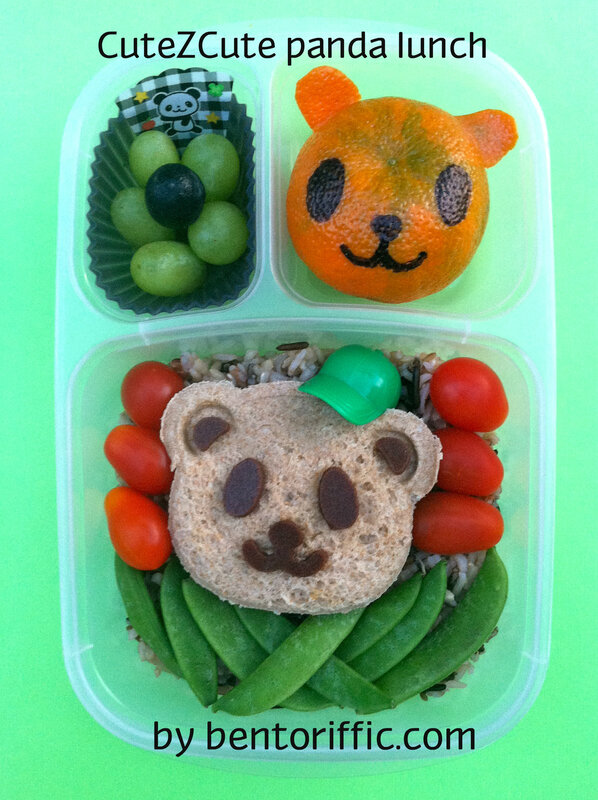 On the left side of the bento box are mini carrots, bear shaped watermelon pieces and pineapple chunks with more fun bear picks. My husband gets a baby spinach salad made into a funky food face. 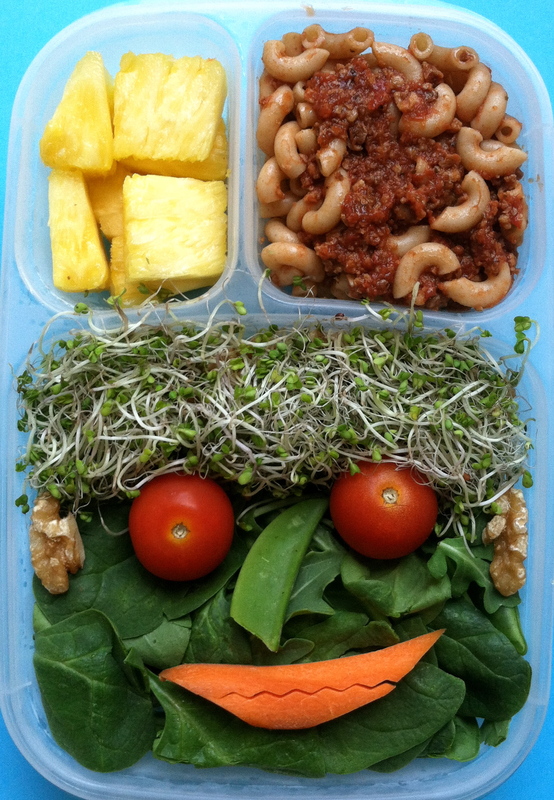 Broccoli sprouts make up the hair, cherry tomatoes for the eyes, a sugar snap pea for the nose, a carrot for the mouth cut with a crinkle cutter and walnut ears. I buried more walnuts and peas under the face for him to find while he’s eating. At the top left are pineapple pieces and at the top right is leftover whole grain elbow macaroni with marinara sauce & veggy crumbles packed in his Easy Lunch Boxes container. My girls are at home with me during they day so unless we have an outing, we’re not packing many bento-style lunches these days. Miss G is under the weather with a fever so we’re on quarantine for a few days too until she’s well. Today Miss A asked more more little sandwiches. I have some great options from my sets that I got from Bento USA. 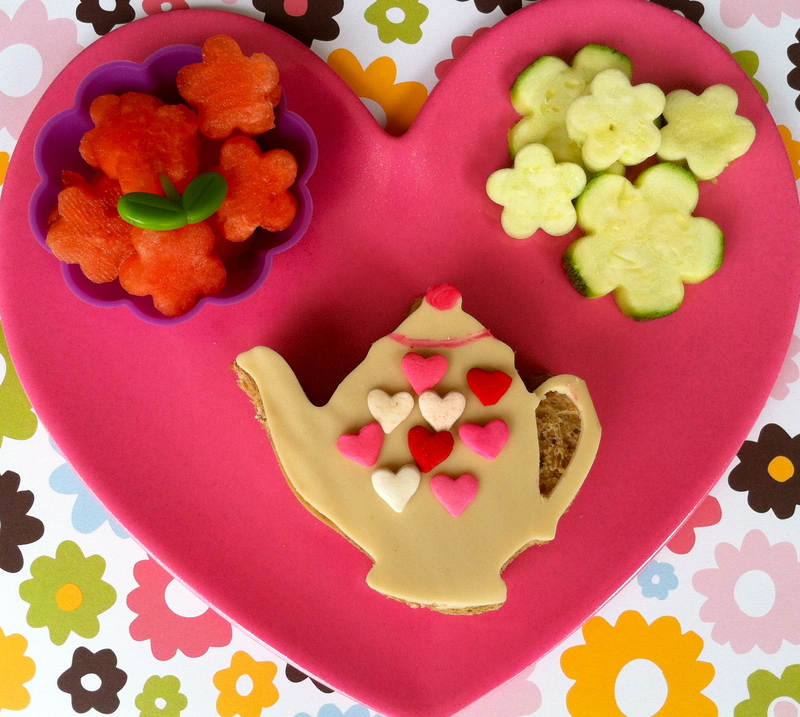 I used the flower cutter from this set for her little flower sandwiches. Click on the picture for the link to their site. Miss A had Tofurkey deli slices on Rudi’s Whole Grain bread. I used zucchini for the white flowers and the leftover rind for the stems of the flowers. From the top left are Way Better brand Simply Sweet Potato Tortilla Chips (they have chia seeds and quinoa in them! 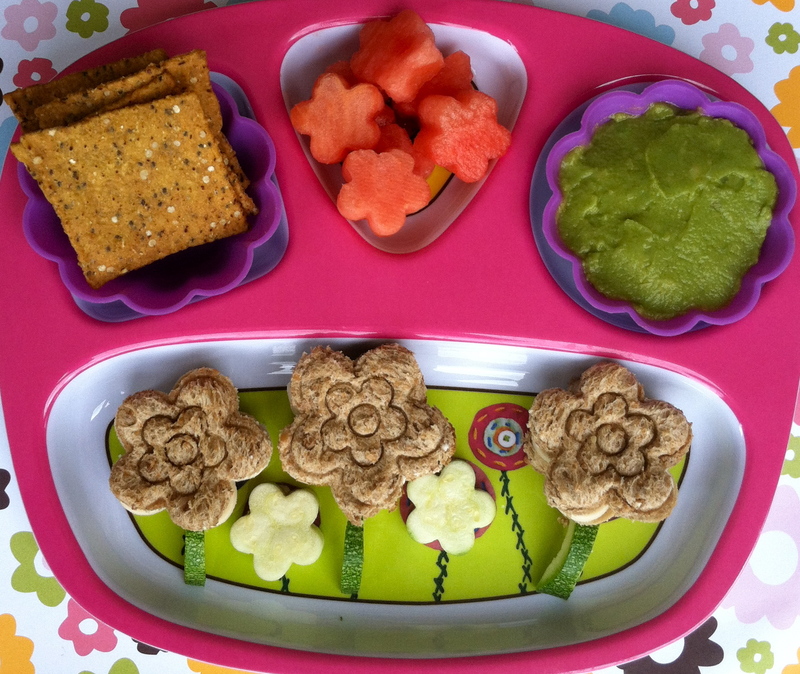 ), watermelon flowers and a flower of guacamole for dipping on the right. Miss Sicky has a flop of a lunch. I really meant to take some time with the teapot, but the more I tried the worse it looked. Sometimes the image in my head is much prettier than the lunch itself. The teapot sandwich is a Tofurkey deli slice sandwich on Rudi’s Whole Grain bread. The top is a slice of Vegan brand cheese. I stared with a food coloring marker, and it went down hill from there. I ripped the teapot handle, and I had to cover up some messy polka dots with some bad-for-you heart sprinkles to salvage it. At the top left are watermelon flowers and at the top right are zucchini flowers. The best part with little kids is that they even love the failures. For all the smaller flowers, I use the flower cutter from this set of small cutters that I have. I get lots of questions about which tools I use the most so I’m trying to include photos and links to those products for those who are interested. I love these cutters because they never rust, they’re very easy to clean, and you can use them for just about any food item you want to cut. If you click on the photo, it will take you to Bento USA’s site for more bento accessories. Today is the last day to enter to win my FunBites Giveaway. Click on the link below and be sure to use separate comments for each chance to win your choice of the Luv It or Cube It cutter. Stay tuned for another giveaway right around the corner!!! Wishing everyone a fabulous weekend. I have a bento supply and accessory addiction. It’s no secret to anyone who knows me well. 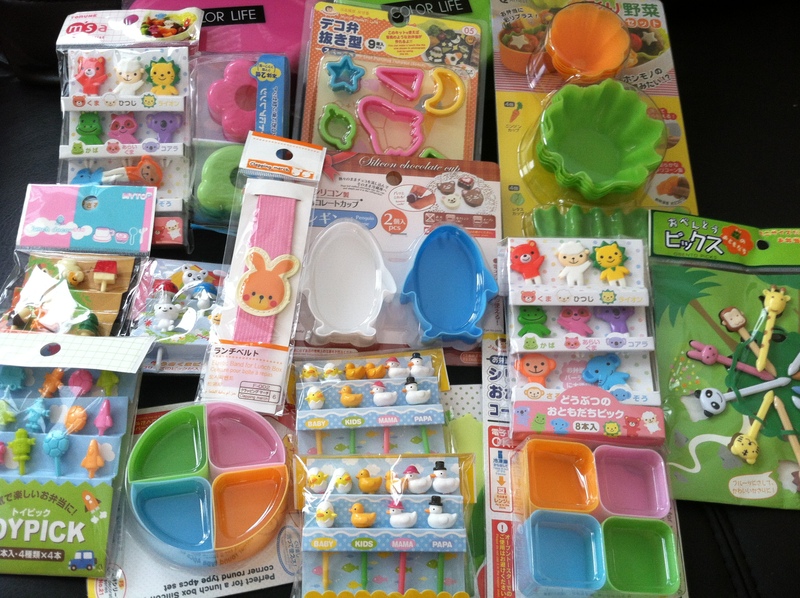 Here is a photo of my recent orders from Bento USA by All Things For Sale. In my opinion, they are probably the most complete and affordable resource for bento supplies that can be purchased on line. In my most recent package, I had a gift from Bento USA by All Things For Sale to try out so I made little Miss A’s lunch with it. She loves the smaller sandwiches I make for her. They don’t last long! These cute cutters are a rabbit, an elephant and a bear. Her sandwiches are on Rudi’s Whole Grain bread with Tofurkey brand deli slices (vegan) and Vegan brand cheese. 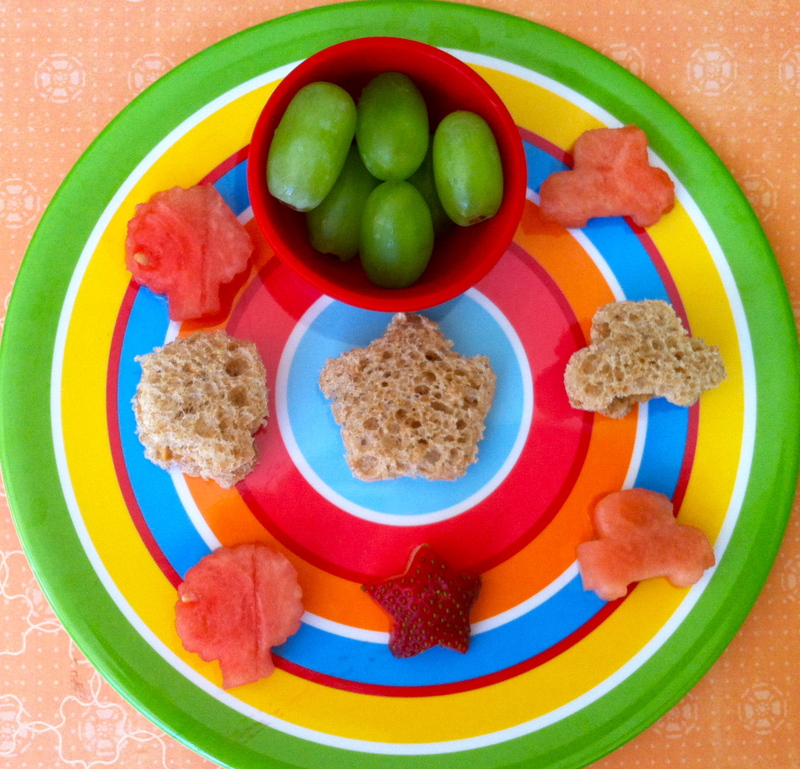 In the pink bunny container are dried cranberries, in the middle are green grapes with an elephant pick and in the blue bear are blueberries. Here are the cutters I used. Please click on the photo to view more items at Bento USA by All Things For Sale. And Miss G has a heart with a surprised face. At the top left are green and red grapes and at the top right are honeydew melon chunks with face picks. Two more days to enter to win your choice of FunBites cutters! Click on the link here and be sure to comment separately to receive each entry. Still spring break here so lunches are at home every day. Miss G insisted on helping me with lunch today. I promised her that I’d let her help me more often so she chose the cutters to use and wanted to make lunch for her sister too. 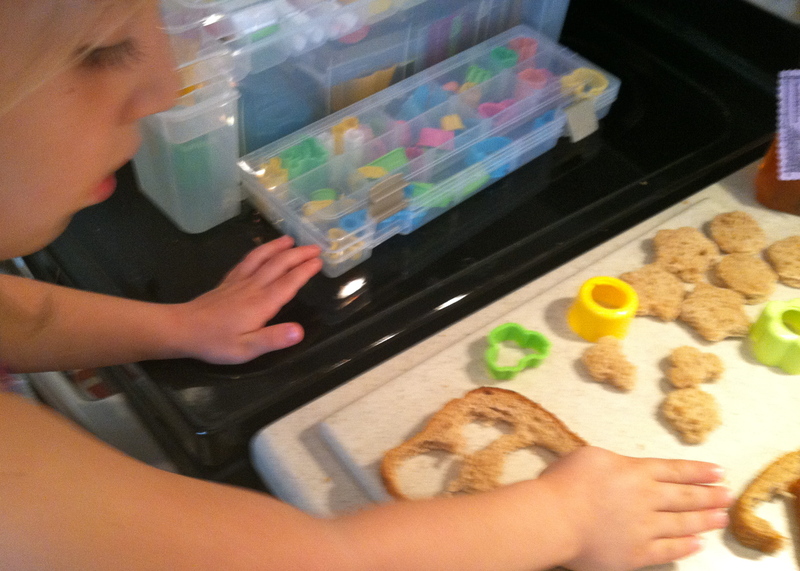 Here she is learning how to cut the shapes out of the bread. She wanted the cute animal faces on her sandwiches so we stamped those on there too. She had peanut butter & agave nectar sandwiches on whole grain bread. A pick of seedless green grapes and below that watermelon squares and 2 halves of a black plum. In the middle is a strawberry. She ate the entire thing because she was SO proud that she made it. Then next she was on to little A’s lunch. She made her a small car, a star and a shell shaped sandwich that looked more like a small tree when it was done. She also made her a bowl of grapes and car & shell shaped watermelon pieces. Even little A ate almost all her lunch today.